1. This is no news to many of you, but libraries are awesome. Now that Amelia is looking through books more and more (and wanting us to read to her more and more) it's nice to switch things up with new stories every once in a while. There are only so many times I can read "Where's Spot" and still act excited about it. 2. Along those lines, we have found some terrible (as in really, really stupid) and some great kid's books so far. Among the winners are two books that we bought for ourselves to have at home. One of them is the Brown Paper Teddy Bear. The story in this book isn't anything special but the pictures are gorgeous. Amelia loves looking through it and my husband and I geek out over how pretty it is. The other favorite we had to buy for ourselves? 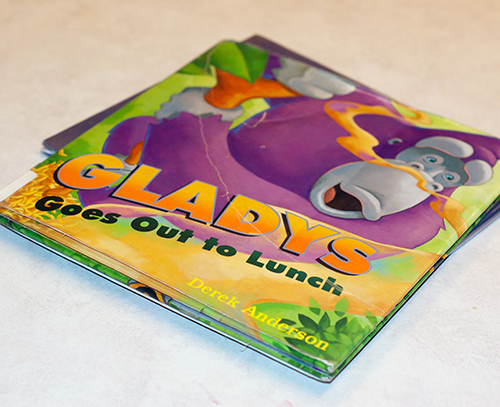 Gladys Goes Out To Lunch. This one is turning into "the" bedtime story. Don't ask my why, exactly. It's just that any other book is promptly kicked or punched away until we give in and Gladys appears. 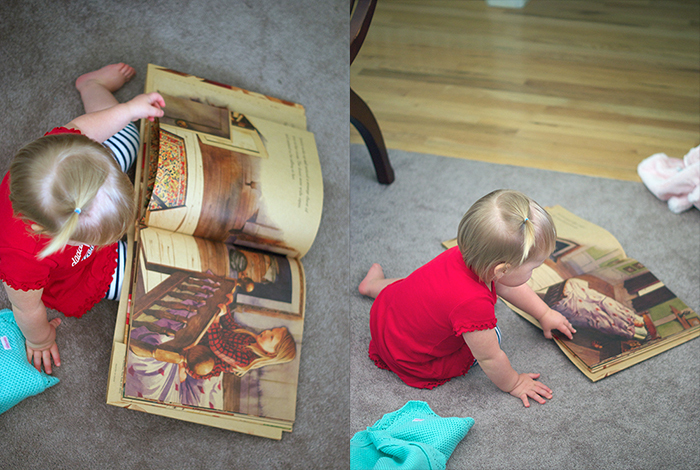 Then Amelia will sit in rapt attention while we read it again and again. The pictures are great, and I think Amelia loves to look at that purple gorilla. There is a banana bread recipe at the end that I swear I will try one day. 3. Have you ever seen one of these? 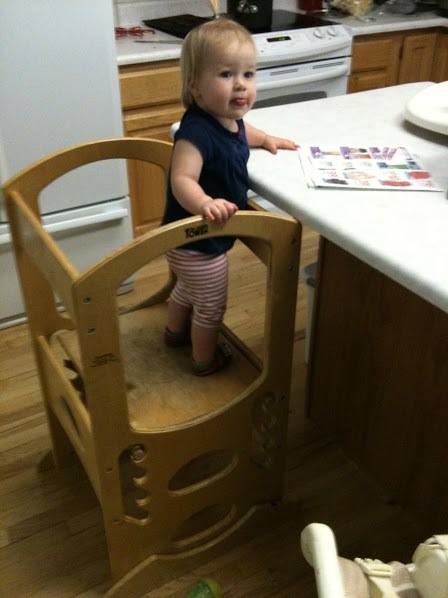 It is called a Learning Tower and it is meant to let little ones be at counter level so they can "help" cook, see what is going on up there, and generally stop hanging on your legs every time you are in the kitchen. A good friend and fabulous (on hiatus) food blogger Paula told me about them and how much they love theirs. 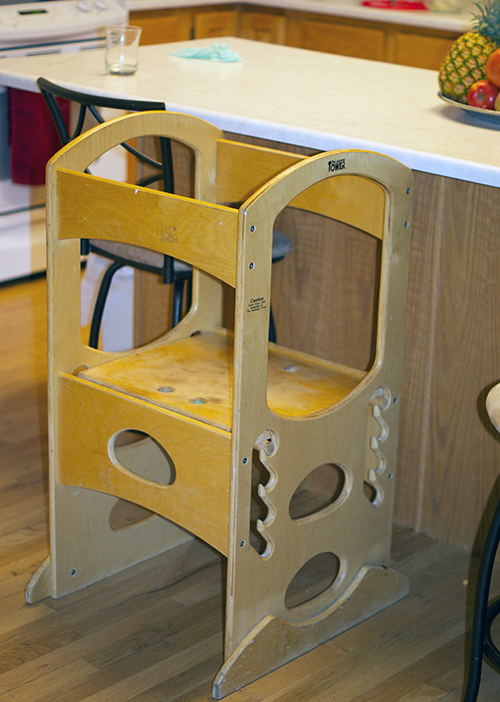 They aren't cheap on Amazon, but we found a used one on a classified ad and bought it this week. So far Amelia is a big fan. She's already spent a lot of time playing at the sink and watching me chop up veggies for dinner. And also grabbing a knife out of the dish drainer that I didn't know was there. 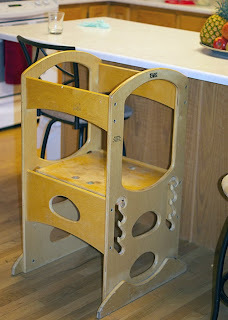 Definitely watch your toddler full time when they are in these things, but so far we really like ours. I just loved reading with my kids when they were little, or just watch them flip through the pages of their favorite books. That learning tower is such a great idea! Wish I would've known about that years ago! I love that little learning tower! In the far far future when I have little ones, I am so getting one. Amelia is so cute! I'm marking down those books- is it weird that I'm already taking notes on cute kids books when I'm not even pregnant? :) That learning tower is such a good idea! So adorable! Libraries are truly so very awesome. Ha, I was thinking she looked so big! :) She definitely couldn't have used it any earlier. It is the perfect height right now and it is on the top setting. Not weird at all! 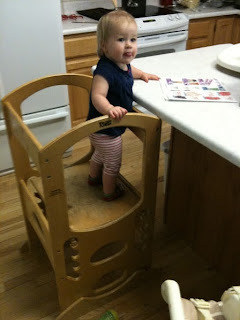 I wish I had paid more attention to these kind of things before Amelia came along.